The latest Canadian victim of the relentless IED campaign by terrorists in Afghanistan was headed home Saturday after his flag-draped coffin was loaded onto a military transport plane. "Steven was a passionate hockey fan who loved his hometown Calgary Flames," said padre Cpt. Steve Defer in a eulogy delivered by the Hercules C130 that will take Marshall to CFB Trenton. "His ever present grin and sense of humour was contagious." One of Marshall's best friends, Sapper Dustin Perry, also called attention to his penchant for cracking jokes, which he said brought out the best in everyone. "Those of us who knew him remember that he was the kind of guy who would do anything for you and ask nothing in return," he said following the ramp ceremony. "He always put his friends before himself." Marshall and Perry had been close since training together at CFB Gagetown three years ago, despite Perry being partial to the Vancouver Canucks. "When Vancouver and the Flames were playing it was gloves off for me and Marshall," Perry said. "Marshall was a very competitive hockey player. I was always kind of jealous of his skills." There has been more than 60 per cent increase in the use of IEDs in Afghanistan between 2006 and 2008 according to some analysts. It has already tracked well over 100 more cases in 2009 than for all of 2008. Since April 2007, 65 of the 88 Canadian deaths in Afghanistan have been the result of improvised explosive devices. As a combat engineer, Sapper Marshall was on the front lines of efforts to minimize the threat presented by the home-made bombs. "With his skills Steven held one of the critical keys to a lasting peace in Afghanistan," said Defer. "Clearing the mines and IEDs that threaten our soldiers promises more than just our safety, but also, it offers the real promise that the people of Afghanistan might one day know a truly lasting freedom." Marshall was working in an area thought critical for the future success of the counter-insurgency strategy initiated by Brig.-Gen. Jonathan Vance earlier this year. The Canadian military is working to establish a series of model villages in the Dand district that will allow them to separate insurgents from the population at large by providing security and basic economic development. Canada's previous casualty was Pte. 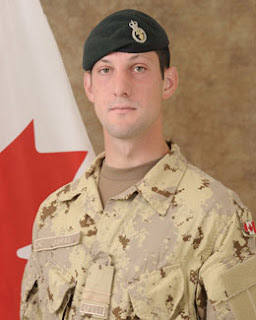 Jonathan Couturier of the 2nd Battalion, Royal 22nd Regiment, based in Valcartier, Que., who died when his armoured vehicle struck an improvised explosive device on Sept. 17. 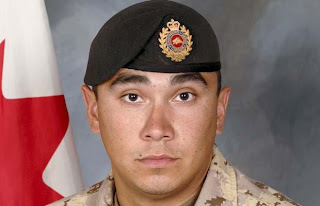 Boyes is the 132nd Canadian soldier to die in Afghanistan since the mission began in 2002. The vast majority of dead and wounded have occured since Canada became responsible for security operations in Kandahar in early 2006. 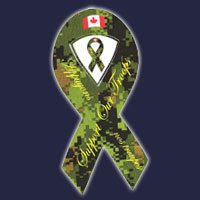 True Patriot Love is an organization founded by corporate and community leaders dedicated to raising funds for programs to improve the well-being and morale of members of the Canadian military and their families, and to celebrate their selfless service. They strive to help meet the needs of Canadian heroes serving at home and abroad, as well as the needs of the families who support them. In addition to ongoing fundraising, their signature initiative is the annual True Patriot Love Tribute Dinner, a benefit in support of the Canadian Military Families Fund - a fund established by Canada's former Chief of Defence staff, Gen. Rick Hillier. The inaugural event will be held in Toronto on November 10, 2009. Blue, is a US Army Senior NCO on his second tour of duty in Afghanistan. He has a very interesting piece up on his blog Afghan Quest regarding insurgent strategy, including the recent events at COP Keating. He writes: "I’m convinced that the latest attack in Nuristan is part of a larger operational strategy on the part of insurgents. Actually, I believe that it ties in to the persistent insurgent presence in the Tag Ab Valley of Kapisa. Numerous rat lines have existed through Kunar and Nuristan, many of them leading to Tag Ab, which ties them in to the ancient smuggling route that avoids the capital… or leads to it. There is no doubt in my mind that the increase in violence is tied to the increase in Coalition (and GIRoA) presence in Kunar and Nuristan. There was no reason for violence prior to the increased presence and control in Kunar and Nuristan, because they had free run of the area. The people were easily intimidated and there is significant appeal to residents because they are so isolated and fear outside (especially un-Islamic) presence. In this area, Arabs are preferable to Americans as far as the locals are concerned… and they bring money to pay for local men to participate." Afghan Quest is must reading for those seeking infromation about events on the ground from the perspective of a front line Soldier with experience and excellent contacts. The Soldiers at COP Keating, a very remote outpost in Nuristan province, were scheduled to be be redeployed to population centric areas of Afghanistan as part of General Stanley McChrystal's counterinsurgency to protect the Afghan people. Nuristan was never a place that coalition troops should have been deployed to in the first place. It is a center for jewel smuggling and the people there don't need or want help from the coalition. It has no strategic value to the war effort. Here is a piece from Karen Russo that sheds more light on the recent battle. The pilot of an Apache gunship who flew to the rescue of U.S. soldiers nearly overrun at a remote outpost in Afghanistan last weekend told ABC News today that he had "never seen that large of a force" attacking coalition troops in Afghanistan. By the time Chief Warrant Officer 3 Ross Lewallen and Chief Warrant Officer 2 Chad Bardwell arrived over the embattled outpost, dubbed Camp Keating, parts were in flames and dozens of insurgents could be seen on the camp's perimeter. When the battle was over and the fire extinguished, many who survived had nothing left "except the clothes off their backs and the weapons in their hands," one soldier told ABC News. The pilots and two ground controllers who were at Keating spoke to ABC News, providing fresh details of the weekend battle, the bloodiest engagement in Afghanistan in the past year. The firefight, which killed eight U.S. troops and left 24 soldiers wounded, came as President Obama is formulating a revised strategy for the now eight-year-long war in Afghanistan. "When we first showed up and put our sensors on Keating, it was just kind of shock," said Bardwell, 35, of Liman, Wyo., who piloted one of a swarm of Apaches that rushed the base's defense. "All the amount of flames and the smoke and to see that amount of personnel running outside of their wire. It was really kind of shock." Lewallen added, "I've been on three deployments and I've never seen that large of a force attacking one static position." When he first arrived on the scene Saturday, Lewallen said he could see about 30 fighters just along the camp's perimeter. The number of attackers has been estimated from 100 to 200. Lewallen said he thought as many as 350 were involved in the assault. Hunkered down inside the base's operations center were 1st Lt. Cason Shrode, 24, of Dallas, and Sgt. Jayson Souter, 22, of Tuscon, Ariz. The two men were working radios and directing traffic for the Apaches and attack jets that swarmed overhead. But they knew the camp was ablaze and that insurgents had breached the camp's defenses and were inside the wire. "It's definitely not a comfortable feeling to be at a place where you're most vulnerable, just not a comfortable feeling knowing these guys are right outside," Souter told ABC News. The camp is located at the base of two steep mountains, allowing the enemy to fire down on the camp with a powerful .50 caliber machine gun and other heavy guns. The U.S. and Afghan army Soldiers inside Keating had been reduced in ranks because the camp was scheduled to be closed as part of Gen. Stanley McChrystal's strategy of pulling back from sparsely populated areas to protect population centers instead. The camp's defenders, who endured small attacks several times a week, had been warned by villagers about 10 minutes before the onslaught began. While the camp prepared for a pending attack, soldiers were not alarmed by the warning because it was one of the almost daily stream of tips they received. "We get reports all the time," Shrode said. "I will say it's 50-50 [the attack] will happen." The soldiers quickly realized the assault was much larger than any they had ever endured. The camp's generator was hit immediately, plunging the camp into pre-dawn darkness. Soon the camp was on fire with strong winds fanning it along to additional buildings. Eventually, every building in the camp, except one, was burned. "We were basically surrounded 360 degrees," Shrode said. "I think there were significant numbers [of enemy fighters] throughout the day." He immediately called for air support. "We had fixed wing [jets] 20 minutes after fight started," Shrode told ABC News. "We had helicopters 20 minutes later. ... We had so many different assets up in the air ... they were stacked on so many different levels." Nevertheless, the battle raged throughout the morning. There was a lull about noon, before the attack resumed. "We had everything we needed. It was just a big attack with a lot of people. Bad things happen, but I think we did well, considering the circumstances." He added that cooperation with the air cover ensured that a "bad situation did not turn worse." For the pilots, it was, at times, difficult to find the enemy. And because of the smoke, visibility was restricted to a half mile. "One of the primary reasons the fight took so long, it is in extreme terrain," said Lewallen, of Clarksville, Tenn. "There are a lot of rocks and a lot of cover. You really can't detect the enemy until they start moving again." Three of the attacking Apaches were damaged by insurgent fire, officials said. By the afternoon, cloud cover moved in, which helped reveal the position of enemy gunners. "At that time we were able to see some of the larger muzzle flashes that were a little higher in the mountains," Lewallen said. "We started to eliminate the larger weapons." One concern was a report that several large caliber weapons were trained on the helicopter landing zone, waiting for a Medevac flight to take out the wounded. The Medevac chopper didn't arrive until after 9 p.m. that night under the cover of darkness and after those weapons had been located and destroyed. ABC News had previously reported that when the Medevac flight arrived, some of the wounded refused a chance to leave Keating and kept on fighting. Soldiers also confirmed an earlier ABC News report that some troops gave blood during the fight to be transfused into wounded comrades. When the attack was over, Souter and Shrode said the soldiers checked on each other and assessed the damage. The fire had destroyed much of the camp. Lost in the blaze were "cameras, movies, stuff that helps you pass the time ... but there were guys who literally lost everything except the clothes off their backs and the weapons in their hands," Souter said. Eight soldiers from Fort Carson's 4th Brigade Combat Team died in Afghanistan when insurgents attacked a pair of remote outposts in Nuristan province, two Colorado Springs media outlets reported Sunday. The Army hasn't identified the dead, but the Colorado Springs Gazette and KOAA-TV said military sources confirmed that all eight were from the 4th Infantry Division's 4th Brigade, which went to war in May. U.S. military officials said Sunday that the day-long battle near the Pakistan border, in which the eight U.S. soldiers were killed as hundreds of insurgents stormed a pair of remote outposts, is likely to fuel the debate in Washington over the direction of the troubled eight-year war effort. The insurgents were armed with automatic rifles and rocket-propelled grenades during the fierce gunbattle Saturday in the Kamdesh district of Afghanistan's mountainous Nuristan province. It was the heaviest U.S. loss of life in a single battle since July 2008, when nine American soldiers were killed in a raid on an outpost in the same province. U.S. troops used artillery, helicopter gunships and airstrikes to repel the attackers, inflicting "heavy enemy casualties," according to a NATO statement. Fighting persisted in the area Sunday, U.S. and Afghan officials said. The Taliban claimed responsibility for the attack. Brig. Gen. Eric Tremblay, a spokesman for NATO, said the assailants included a mix of "tribal militias," Taliban and fighters loyal to Sirajudin Haqqani, an al-Qaeda-linked militant based in sanctuaries in the tribal areas of Pakistan near the Afghan border. "This was a complex attack in a difficult area," U.S. Col. Randy George, the area commander, said in a statement. "Both the U.S. and Afghan soldiers fought bravely together." Details of the attack remained unclear Sunday, and there were conflicting reports of Afghan losses because of poor communications in the area, 20 miles from the Pakistani border and about 150 miles from Kabul. Denver Post staff writer Tom McGhee and Associated Press writers Rahim Faiez and Lori Hinnant in Kabul and Noor Khan in Kandahar contributed to this report. Apparently the president feels that the Chicago Olympics is more important than the War in Afghanistan that he campaigned on as a must win. I hope that's not the case but th following story from CanWest News doesn't bode well for the people of Afghanistan nor the Soldiers who have fought, shed blood and died there. WASHINGTON -- President Barack Obama summoned his top commander in Afghanistan for private talks aboard Air Force One on Friday amid new signals White House officials are deeply divided over a request to send up to 40,000 more troops to fight the eight-year-old war. The 25-minute meeting between Obama and Gen. Stanley McChrystal occurred in Copenhagen, where the U.S. president had travelled to support Chicago's unsuccessful bid for the 2016 Olympics. It marked the first time in months the two men had spoken in person about deteriorating security conditions in Afghanistan, and as McChrystal wages an unusually public campaign in favour of a U.S. troop surge. The four-star general had been in London only hours earlier delivering a speech in which he rejected a proposal - reportedly being pushed by Vice-President Joe Biden - to narrow the focus of U.S. operations in Afghanistan. "Gen. McChrystal expects that the president and others are going to ask him questions about the assessment that he's made," said White House press secretary Robert Gibbs, "and that we're going to ask questions of our diplomatic side, of our intelligence side, and of all of those involved in this to get the best strategy for success in Afghanistan." Mr. Obama is in the midst of a prolonged review of the U.S. role in Afghanistan and as the Pentagon warns the American-led NATO mission could fail within a year unless there is a dramatic overhaul of the coalition strategy. Gen. McChrystal is lobbying for the White House to embrace a shift in strategy that focuses on greater protection of the Afghan population, while placing less emphasis on winning tactical victories over Taliban insurgents. The commander last week informed Admiral Mike Mullen, the chairman of the U.S. Joint Chiefs of Staff, he needs 30,000 to 40,000 additional American troops to meet that task. In a classified review of the war that was leaked last week, McChrystal warned a failure to reverse the situation in Afghanistan within a year could produce "an outcome where defeating the insurgency is no longer possible." But Gen. McChrystal's recommendations have been met with deep skepticism among some of Obama's most senior advisers. Mr. Biden was among the administration officials who challenged the assumptions behind Gen. McChrystal's request during a three-hour meeting of Obama's war council on Wednesday in the White House's Situation Room, according to the Washington Post. Among the biggest questions being asked in the White House is whether the Afghan government can be a reliable partner in economic development and improved governance - especially in the wake of ongoing corruption and the still-disputed August presidential election. The U.S vice-president and others in the White House are said to favour maintaining U.S. force levels at 68,000, while stepping up surgical strikes on al-Qaeda targets inside the country. Defence Secretary Robert Gates, meantime, is tilting towards an endorsement of Gen. McChrystal, CNN reported Friday. Secretary of State Hillary Clinton has not publicly indicated whether she favours more troops. Gen. McChrystal dismissed as "short sighted" the idea of narrowing the focus of the war in a speech to the Institute for Strategic Studies in London on Thursday, prior to his meeting with Mr. Obama on Air Force One. "The short answer is no," McChrystal said when asked in London if he would back a scaled-down strategy that emphasized targeting al-Qaeda with unmanned aerial drones. Since taking office last January, Mr. Obama has committed 21,000 new U.S. troops to Afghanistan as part of a strategy that linked stability in Pakistan to the outcome of the Afghan war. But with American public opinion souring on the war, Mr. Obama has come under increased pressure from Democrats in Congress to reject a military surge. He has also faced criticism from Republicans, who say the White House is taking too long to conduct its review of the war. Until Friday, Mr. Obama had not met face to face with Gen. McChrystal since the summer, although they spoke via teleconference on Wednesday and on another occasion in August. This is a preview to the Frontline documentary special to air on October 13. The future of Afghanistan is in the hands of the Obama administration. The decisions are being made by his administration at this moment. We'll know soon enough whether he makes the right one.